The wonderful news of an effective treatment is being heard around the world, as families, researchers, and PRF supporters celebrate this historic milestone. We pay tribute to the many wonderful people and organizations that helped make this day possible. 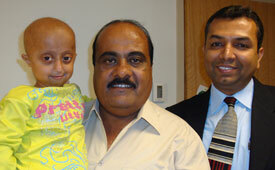 To the children with Progeria and their families, thank you for your inspirational spirit and boundless courage. To our donors and volunteers, thank you for your steadfast commitment, your unwavering generosity, and your endless energy. The children who participated in the first-ever Progeria clinical drug trial, which proved that the FTI drug lonafarnib is an effective treatment. We achieved breakthrough results in this first trial because of the tremendous supporters who provided their time, talents and treasure, helping get us one step closer to achieving our ultimate goal of a cure for Progeria. The logos and lists represent the clinical trial team, as well as many who gave money, plane tickets, toys, the drug, housing, rides to and from the airport, travel assistance, and translation, legal and design services. We also recognize the thousands of people who participated in special fundraising events that helped raise the $2 million needed for PRF to fund the trial. ALL of this is what got us to a treatment. And it is what will lead us to the CURE. Over forty events that took place all over the world, run by our Miracle Maker volunteers! Nearly 500 of you donated from $5 to $500,000 – THANK YOU ALL FOR YOUR GENEROSITY!